The vent valve is built into the canister pump module. 5 hours* after the ignition switch is turned off, the leak detection pump creates negative pressure (vacuum) in the EVAP (Evaporative Emission) system. The ECM monitors for leaks and actuator malfunctions based on the EVAP pressure. Activated by soak timer, 5 hours (7 or 9.5 hours) after ignition switch is turned off. Negative pressure (vacuum) is created in EVAP system, and then EVAP system pressure is measured. Write down measured value as they will be used in leak check. If stabilized system pressure is higher than second reference pressure, ECM determines that there is a leak in EVAP system. 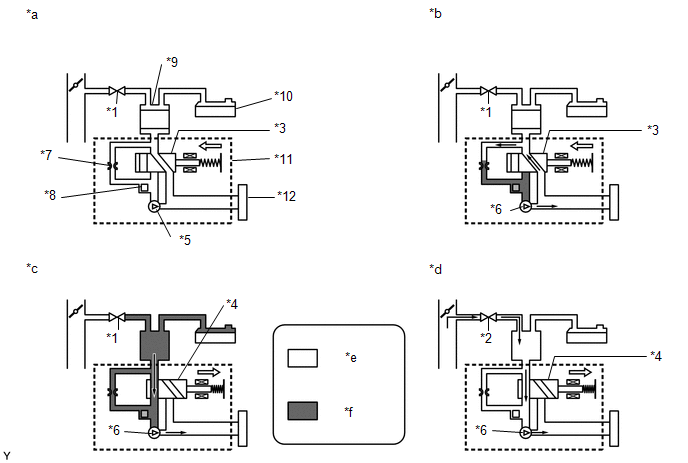 In operation C, the vent valve turns on (closed) and the EVAP system pressure is then measured by the ECM using the canister pressure sensor to conduct an EVAP leak check. 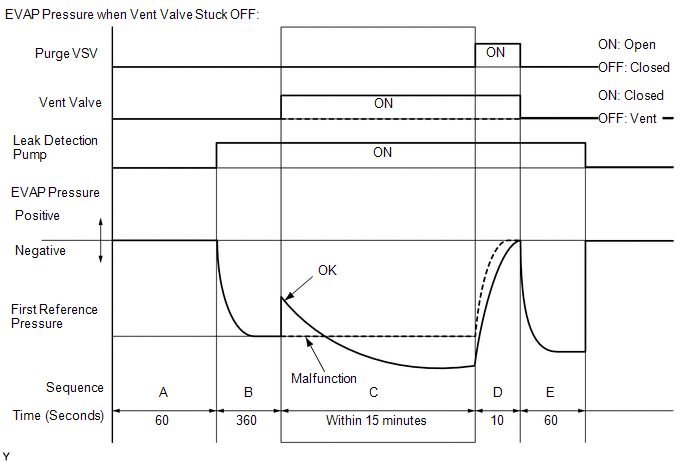 If the pressure does not increase when the vent valve is open, the ECM interprets this as the vent valve being stuck open. The ECM illuminates the MIL and stores the DTC. After the "Evaporative System Check" is completed, check for All Readiness by entering the following menus: Powertrain / Engine / Utility / All Readiness.